A Syrian mother gives water to her son in Lebanon, who is desperately ill with cancer. The influx of so many refugees has severely stretched health services. 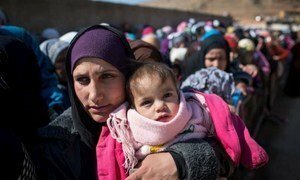 Now in its fourth year, the Syrian conflict hit yet another bleak milestone today, as the United Nations refugee agency reported that the number of displaced seeking refuge in neighbouring Lebanon has passed the one million mark, putting more pressure on a host community that is already stretched to the breaking point.